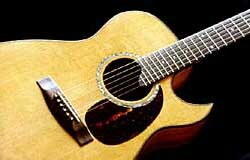 My interest in the guitar has primarily been in playing the music, especially fingerstyle on steel strings, but a great fascination with tone and structure compelled me to try to understand how the elements of wood and metal could combine to produce such sweet sounds. The only way to really get an understanding of this 'magic' was to experiment a bit and actually make some instruments. 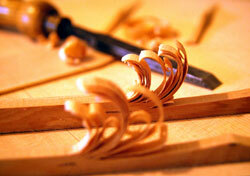 I quickly learned that the woods used in the construction of an instrument hold a large part of the secret. The word 'timbre' means 'the characteristic quality of a sound, independent of pitch and loudness' and, interestingly, it is an anagram of the word 'timber' meaning 'wood, for the purpose of building'. 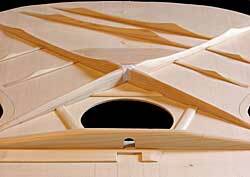 The quality of the 'timber' will determine the 'timbre' of the instrument. I decided there was little point in building guitars with anything but the very best woods. I don't propose to write much about luthiery as there is already such a great volume of technical information available on the web. I obtained a copy of William Cumpiano and Jonathan D Natelson's book 'Guitarmaking: Tradition and Technology', which I would highly recommend to anyone interested in building acoustic guitars. Some information and procedures have been updated on William Cumpiano's website. 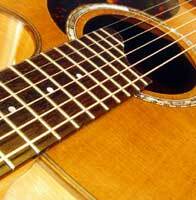 Another great site for stringed instrument builders and repairmen is www.frets.com. It has never been my intention to make a business out of guitar making as I always saw it more as a hobby, but I have found it to be increasingly difficult to keep the guitars I build. I've sold most of the instruments that I've designed and built and I've accepted the occasional commission. The guitar shown to the right was sold to a gentleman in Hong Kong - he gave it as a gift to his daughter for her 21st birthday. I have also built a couple of left handers for a local guitarman plus a classical for a guitarist friend in the US. If I accept a commission I refuse to work to a deadline. Haste is the parent of error and works contrary to my motives for building guitars - if you want a guitar right now, go to a shop; if you want a high quality, unique instrument have patience and start saving now! 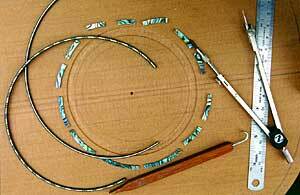 The photo to the left shows all the pieces of a rosette, the pattern around the soundhole, ready for inlaying. I use New Zealand's beautiful paua shell, which I like to collect on the beaches north of my home in Christchurch, for the featured inner circle of the rosette. I like things organic so I use wooden bindings and purflings and as little plastic as possible. Spruce is my wood of choice for tops. I've used sitka spruce from North America and a variety of European spruces. These woods, like a good wine, mature with age and over time the instrument 'warms up' - just listen to a pre-war Martin or an old Gibson. Western red cedar is a very nice choice too and by using this wood you tend to instantly have a 'mature' sound. I've also used redwood (sequoia) with very pleasing results. All these woods have their own character, or timbre, and the variation in sound is what makes life interesting! 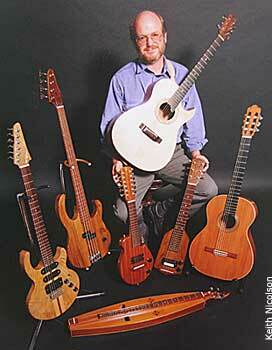 - who wants a collection of guitars that all sound the same? Mahogany, rosewood, maple and walnut all make great side and back material and once again they all have their own character of sound. I like either rosewood or ebony for the fingerboard. Although I have learned a great deal about guitar building through books and trial and error, the big lessons have been through conversations and question sessions with practicing luthiers, especially Peter Stephen. I regard Peter as my mentor and highly recommend a visit to his site - he is a master and his work is superb. Another Christchurch luthier who has been incredibly open and generous with his knowledge and experience is Davy Stuart. Visit Davy's site, especially if you are interested in mandolins, mandolas and alternative acoustic stringed instruments. 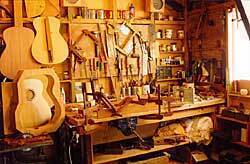 It takes me up to 300 hours to build an acoustic guitar and, as I said earlier, I don't like to rush the process. I work on my instruments during my quiet spells at home and I get immense enjoyment from the procedure. I can never explain the joy I get from playing music, especially my own compositions, on instruments that I have built.